I’ve always felt that one of the hoariest old cliches in the coverage/discussion of Star Trek, lazily trotted out with tiresome regularity, was that ludicrous “theory” that stated that even-numbered Trek movies were “good” and odd-numbered Trek movies were “bad”. Obviously, last year’s masterful and hugely-exciting reboot, the eleventh in the cinematic Treks, has well and truly blown that notion out of the water (and, anyway, it was looking mostly discredited after its predecessor, 2002’s underwhelming swansong for the TNG crew, the Khan-lite Nemesis…) but I’ve always thought that it was a useless notion no matter what. To my mind, all the Trek films are worthwhile watches and, certainly, the odd-numbered film entries have an array of plus-points to their score-cards (yes, even Star Trek V: The Final Frontier…come on: tell me that you don’t love those intimate character moments between Kirk, Spock and McCoy during their camping trip). In particular, I think that the odd/even film theory always did a massive disservice to 1984’s Leonard Nimoy-directed Star Trek III: The Search For Spock. I got to thinking about the third film’s comparative reputation again after listening to Film Score Monthly/Retrograde Records long-awaited release of James Horner’s complete score for Star Trek III(pictured). 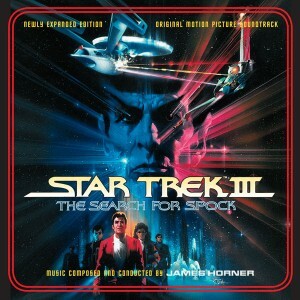 Horner, of course, came to prominence with his superb, nautical-toned score for Star Trek II (also released by FSM/RR last year – both are absolute must-have’s for score collectors.) 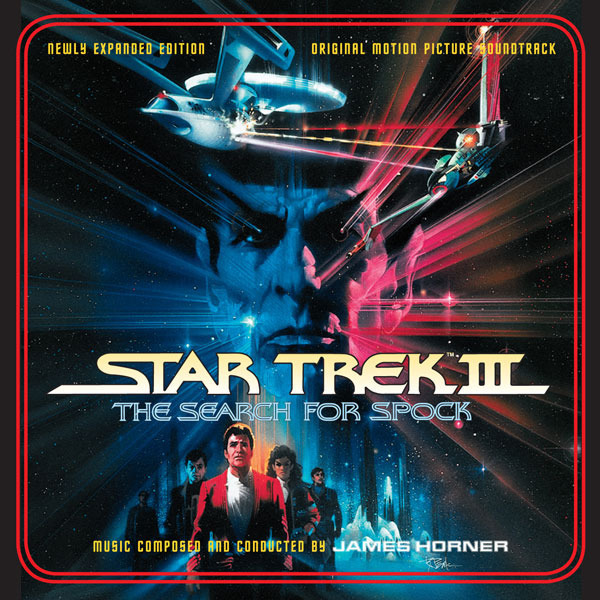 and I think there’s a viable argument to be made that his music for Star Trek is even better than Jerry Goldsmith’s considerable (and iconic) contributions to the franchise. Listening to Horner’s score for III, I was struck by just how effectively it complements its predecessor, maintaining the tone of epic, sweeping grandeur twinned with an engrossing degree of emotional drama. Horner’s exquisite orchestrations reminded me that, actually, the film as a whole does the same – beautifully, in fact. It always puzzled me that TSFS’s apparently-weak reputation was primarily anchored on the fact that it merely followed 1982’s Star Trek II: The Wrath of Khan, which, to this day, is widely seen as the zenith of the films. Granted, Nimoy’s film doesn’t offer a villain of the calibre of Khan Noonien Singh – a common complaint of III – but I don’t think it’s meant to. At its core – and perhaps its most satisfying element – The Wrath of Khan was about the inexorable passage of time and that Kirk’s habitual dismissal of the “no-win” scenario – that which fuels his legendary brand of gung-ho heroism – eventually comes with the most bitter price. When Kirk is offered the unthinkable – a chance to have his friend resurrected – he leaps at the chance to regain a vital presence in his life. Without considering the inevitable price of such a miracle. And what an utterly devastating, unthinkable price it is. Not only does Kirk have to sacrifice, in a vivid sequence, his beloved U.S.S Enterprise – the one place above all others where he feels most vital and alive – but he also has to suffer the death of his son, his living legacy. He has to literally part with the future. These potent senses of grief and bereavement provide the film with a strong dramatic engine – and if that seems out of place in what is ostensibly a mainstream blockbuster, consider that all Christopher Nolan’s films, including The Dark Knight and the heady Inception – are driven by the same thing. Moreover, of all the six films (1979-91) featuring the original Enterprise crew, The Search For Spock is unquestionably the film that truly underlines the boundless loyalty that exists between them. When I first saw the film, aged ten, I distinctly remember being intensely struck by the fact that Kirk and co. were willing to risk pretty much everything for friendship and the preservation of this alternate family that Starfleet service had given them – the reestablishment of which is profoundly hard-won. Similarly, I liked – and still like – the sheer insouciance of Kirk who, when denied permission by Starfleet brass to return to the newborn Genesis planet is asked by Sulu “The word, sir…?”, to which Kirk snaps “The word is “no” – so we are therefore going anyway.” After seeing Kirk so intensely career-minded in The Motion Picture and The Wrath of Khan, it was an engrossing development to see Kirk view such achievements as wholly expendable to the upholding of personal loyalty, wonderfully encapsulated in the film’s bravura sequence where Kirk and co. steal the Enterprise from Spacedock, crippling the new-fangled U.S.S Excelsior to ensure their escape. The Search for Spock is a fine Trek movie, one which has inevitably been stuck in the shadow of a genuinely great Trek movie. While it may have it’s limitations as a standalone Trek adventure, it does superbly continue to mine the thematic riches found in Khan as well as illuminating the strength of the ties that bind the gallant crew of (the late) U.S.S Enterprise. For that alone, it makes a valuable contribution to Star Trek’s integrity and as such deserves praise.